Best Portable Natural Gas Grills For Your Backyard Summer Grill Parties with experience and caution! If you aren't attached to the “portable” aspect, you should check out post on natural gas grill islands which look incredible, and you can even have delivered and assembled at your house. Though most won't come with wheels, they will come with a lot more amazing features like a built-in fridge, running water sink, and much larger cooking areas. Here's our favorite portable natural gas grills so far. What do you think? Leave us a comment with your favorite, and we can check it out then maybe add it to our list. 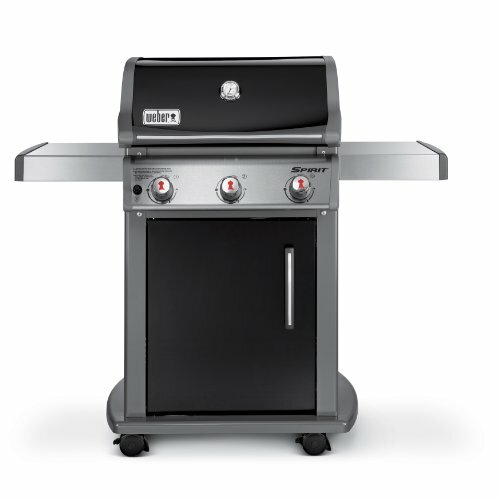 The Q3200 is a lightweight natural gas grill from the generally reliable Weber brand. The 393-square inch total cooking area will provide a wide surface that can be used to cook a variety of food. It contains two durable stainless steel burners that release almost 22,000-BTU's per hour. There are porcelain cast-iron cooking grates that should offer years of use without getting worn down. The lid and body of the grill are made with cast aluminum, and while they look pretty sturdy, some users don’t feel that they are as durable as other materials, such as stainless steel. Starting up this portable natural gas grill is straightforward. It has an easy-start electronic ignition that will take a matter of minutes to get ready. You’ll get a hook-up hose with the grill so you can attach it to the gas line when it’s available. The trays on each side of the grilling surface will give you room to prepare your meat with seasoning and sauces, and place the cooked food on a plate or in a bowl. For a medium sized grill, it is easy to move around. There are two wheels on the right of the grill that can be used to transport the grill without having to lift it up. Most of the material used for this grill is lightweight, so it won’t be a hassle to store. 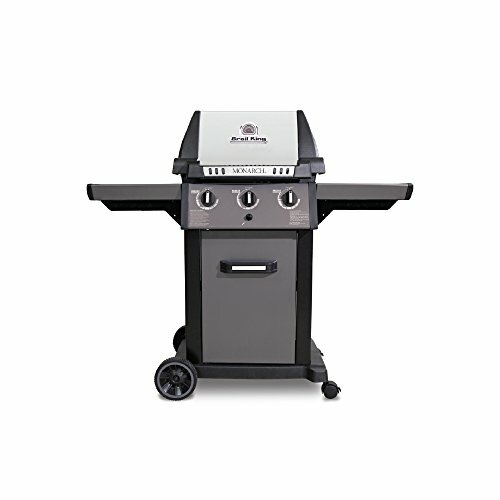 The Genesis II E-310 is one of two superior portable natural gas grills released by the Weber brand. This grill offers something called the GS4 grilling system. The design consists of three stainless steel burners that are backed by natural gas. Flare-ups are almost non-existent because the grease management system makes grease removal easy. While this process is beneficial, some buyers don’t like it because the grease tray is very visible; sitting right underneath the grill itself. The stainless steel side shelves will provide you with room to prepare and organize food, as well as place your cooking utensils in a safe spot thanks to the storage hooks. It is also easy to move around. There are four wheels on the bottom: two big ones, and two small ones. This will allow you to slowly roll the grill from one place to another, or put it on an angle and quickly put it away when you’re finished. There are 513-square inches of cooking space that can be used to cook steaks, burgers, hot dogs, and other meats. Start up the grill by pressing the infinity ignition and then you can get right to work. 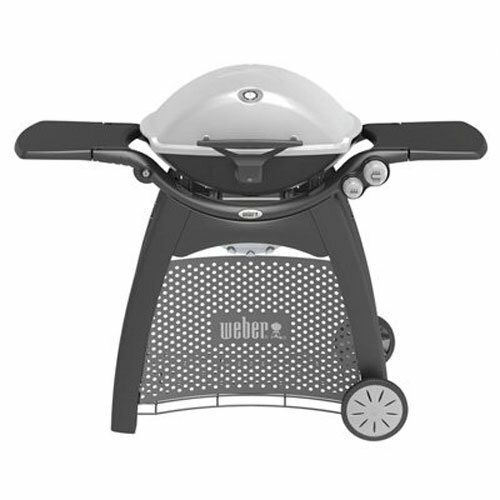 Weber also offers a warranty for the ignition, so if it stops working, you can get it replaced. The Dyna-Glo 4-Burner portable natural gas grill brings some serious heat. The 4 stainless-steel commercial grade straight tube burners produce roughly 12,000-BTU’s each, along with the side burner which releases 12,000-BTU’s; totaling 60,000 BTU’s of cooking power! You also get plenty of room to use those burners. The cooking surface provides 667-square inches, a large platform that will be ready to go for you and those around you. The integrated temperature gauge will provide users with an accurate heating temperature so that they can estimate when they should put their food on the grates and for how long. The electric ignition will start with the push of a button and you can then use the temperature controls to monitor the heat. The Dyna-Glo 4-Burner has a two door setup that will help when storing random grilling accessories. The cast iron grates will keep the heat within the lid while the stainless steel material directs the heat right to the food. This will help food cook evenly at a fast pace. Cleaning is effortless thanks to the matte-enabled finish of the cooking grates. The black Weber Spirit E-310 is another great option. With 424-square inches of cooking area and approximately 105-square inches of warming space, you can cook for a large group. To start the grill, you simply press the electronic crossover ignition button, which releases the natural gas to start heating the grill. 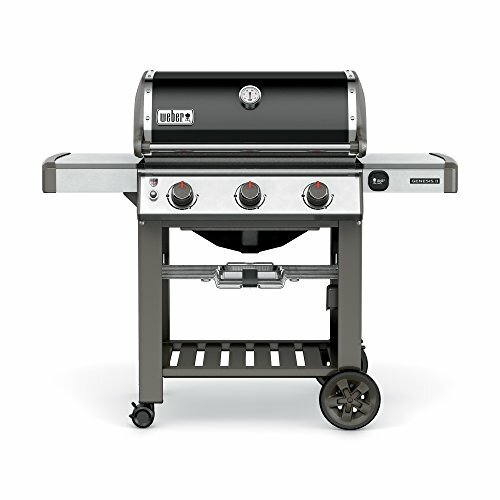 This 3-burner grill has cast iron cooking plates, which are not prone to rusting. While they are reasonably durable, these cooking plates are difficult to clean, which may become an issue for some users. The smaller wheels on the bottom will let you roll the grill back and forth, although it might take more time compared to a grill with larger wheels. This is one of the more expensive grills in this list, but you are buying a large grill that runs on natural gas. Due to the high price, you'll want to protect your investment. That’s why a cover would be helpful for a natural gas grill like the Weber Spirit E-310 so that it doesn’t become damaged when the weather is poor. The Broil King Monarch 320 is a three burner grill that cooks food quickly and starts up quicker. Once the electronic ignition system is started, the 30,000-BTU main burner output will head straight to the 500-square inch cooking platform. The 3 stainless steel dual-tube burners will help heat the grill up rapidly for a quick and easy cook. The entire cooking space is made with tough cast iron cooking grids that can be used consistently without showing signs of damage. This will also make it extremely easy to clean the grates when cooking time is over and done with. No more scraping the grates of your charcoal grill because the leftover food and cheese burned onto the grates. The biggest complaint from those who have used this grill is that there are certain spots that become overwhelmingly hot. This includes the lid handle and the temperature knobs. To protect yourself, you may want to keep a pair of oven mitts or gloves nearby. Which Grill Should You Buy For Your Home? Natural gas grills are wonderful solutions for outdoor cooking, as they can save you time, money, and the environment. While these grills are great, it can be hard to make a final selection. Heating power is also very important for a portable natural gas grill. If you have a lot of family members or love searing meat, a natural gas grill like the Dyna-Glo 4-burner will meet most of your needs. Emitting a total of 60,000-BTU’s, you will have no problem reaching a high cooking temperature in a short period of time. The Weber Q3200 also emits a generous amount of BTU’s per hour. If you’re focusing solely on portability, a light grill such as the Weber Q3200 will give you the heating power needed to evenly cook your food without having a heavy base. This grill has large wheels that will help move the Q3200 pretty fast. The lightweight structure of the Q3200 is very convenient, although it isn’t as durable as a grill like the Broil King Monarch 320. Why Use Natural Gas Instead of Propane? There are plenty of advantages to having a grill with natural gas instead of using propane. Natural gas is typically cheaper than propane, while burning much cleaner. 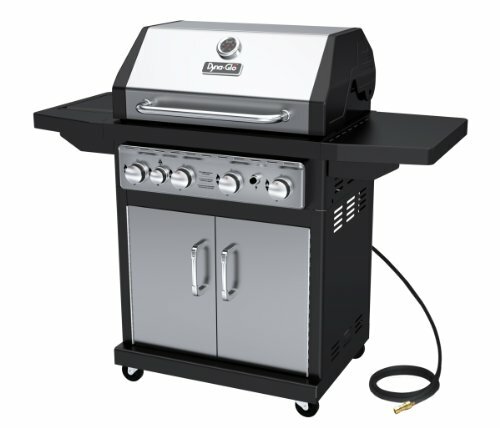 Unlike propane, which is contained in a tank and attached to the grill, natural gas grill have a hose that connects to a residential gas line, which then powers the grill from there. This means no more going back and forth with a heavy propane tank that will leave your back hurting. One downside of using natural gas might be the taste of the food. Some people notice that natural gas can produce a smell, while others don't notice or don't mind. Another downside is safety. With natural gas, if you run into any problem, you have to shut off the gas valve first, sometimes to the entire house! With propane you simply turn the tank off and disconnect. Considering how dangerous gas leaks can be, you may need to call a professional to hook up your grill. The good news is, you won’t necessarily have to purchase a completely new grill if you want to use natural gas, but already have a propane grill. When you’re ready to make the switch, make sure your grill is capable of running on natural gas, then call the manufacturer of your grill and ask for a conversion kit. The installation of the conversion kit is very easy and can be done within a few minutes with the help of a wrench. When you think of a portable grill, you generally picture a small sized grill that can be easily moved and easily set up. Natural gas grills offer a different type of portability, because they essentially receive their heating power from a house gas line and can’t be used without this power source. These grills will be larger in size, very similar to a standard stationary grill, except they will have wheels on the bottom that will allow the user to store it in a safe area when they are done using it. In situations where you are unsure of where the gas line is in your house, the best thing to do is call your gas company and get instructions from them. Most likely, the company will send a certified professional that will help you create the proper set up. Finding the gas line on your own is frowned upon, as it can get pretty dangerous, so it’s best to contact the people that know what they’re doing. If you don't feel like dealing with natural gas, then check out our list of the best portable propane grills. Overall, natural gas grills will benefit the environment and save you the time that would be wasted going back and forth to fill up the propane tank! Now, consider your options and choose the grill that best fits your requirements.